If you don’t feel like going up Taipei 101 but still want the best views of Taipei, go up Elephant Mountain near Xiangshan Station. Warning: It’s a long hike, but the viewing decks are worth it. For a challenge, take a pic atop one of the giant boulders with Taipei 101 as your backdrop. Eat at a night market. You can’t visit Taipei without going to at least one night market! Go to Raohe Night Market for the yummy black pepper pork buns and Shilin Night Market for seafood, stinky tofu, and Taiwan’s signature extra large Hot Star Chicken. Go clothes shopping at Four Four South Village. This former military village is now a quirky cultural hub for art lovers. The old buildings make a great backdrop for your IG photo ops, and if you’re there on the weekend, you can buy clothes and knick-knacks from the cool kids at the Simple Market. Eat xiao long bao at a Din Tai Fung branch. If you love dim sum, you have to eat at the original home of Michelin star-awarded Din Tai Fung. Aside from the xiao long bao, we also recommend their beef brisket noodle soup. To avoid long queues, go really early or late at night. Enjoy the works at the Taipei Museum of Contemporary Art. This beautiful museum houses different exhibits from local and Asian artists. It has hosted photographer Mika Ninagawa’s exhibit in the past and was recently home to Asia’s first big LGBTQ art exhibit, Spectrosynthesis. Tip: They give free entrance to families on Sundays. Drink tea at Maokong Tea Village. After enjoying a Maokong Gondola ride in a glass-floored crystal cabin (it costs the same as a regular one! ), walk around and explore the nearby tea houses for a relaxing afternoon tea. You can also try their special dishes cooked with tea. Stock up on stationery at Guang Nan Wholesale Store. You’ll find this multi-story bargain shopping paradise just a short walk away from Taipei Main Station. Aside from having super cute (and super cheap) notebooks, pens, and stationery items, it’s got entire floors dedicated to music/movies, food, and beauty products. Drink bubble tea—lots of it. Try a new place every day! Some popular chains for good pearl milk tea are 50 Lan and Chun Shui Tang. They say the latter invented bubble tea, and if you visit the Chun Shui Tang Cultural Tea House in Taichung, you can even make your own! Get an IG-worthy snap at the Rainbow Bridge. Across the Keelung River near Raohe Night Market, you’ll find this S-shaped bridge, which glows with pretty lights at night. If you want a gorgeous night photo of the city, this is where you should take it. Watch a street performance at Huashan 1914 Creative Park. This huge park is an artists’ haven filled with art exhibits, art shops, cafés, and performance halls. There are plenty of street performers roaming around the park, too, so you can watch everything from magic shows to acrobatics. Catch world-famous juggler Valentin Lechat’s show, and you’re in for a treat! Relive your Meteor Garden Days at PS BuBu Café. If your Asian drama journey began with Meteor Garden, you’ll love this cute vintage car-themed café where Shan Cai and Dao Ming Si had a date. Who knows? You might even meet your own F4 while you’re there! Shop ‘til you drop at Taipei City Mall. Ximending is on every fashion forward traveler’s Taipei itinerary, but if you want a one-stop shop for all your shopping needs, you don’t even have to go out of Taipei Main Station. Taipei City Mall is a large underground shopping mecca that has everything from anime and toy vending machines to clothes, accessories, and souvenirs. They’ve got an entire section for restos and food stalls too! Relax at a hot spring resort in Beitou. Taiwan boasts of many hot springs, among them the famous Beitou Hot Springs in Northern Taipei, where the Datun Volcanoes lie. Here you’ll find resorts and bathhouses for all sorts of budgets. If you’ve got the money for it, you can go for a private or a luxury resort. Get spirited away to Jiufen. Hayao Miyazaki lovers, especially fans of the animated film Spirited Away, will find much to love in Jiufen. Here you’ll see the A-Mei Tea House, the inspiration behind the bathhouse in the movie. Don’t forget to try the taro balls too! Explore the rock formations at Yeh Liu Geo Park. This park is filled with rock formations that naturally form familiar-looking shapes like a turtle, candle, or bunch of mushrooms, the most famous one being a formation called the Queen’s Head. The sea also looks absolutely breath-taking here, and you can hear the crashing of the waves as you walk around. Let your wishes fly away on a sky lantern. There are two popular places for lighting lanterns: Shifen and Pixing. Different lantern colors represent different things like your wishes for your health, career, or love. If you want to take part in a big event, Taiwan typically holds their Sky Lantern Festival at the end of Chinese New Year. Take epic photos at Zhong She Flower Market. 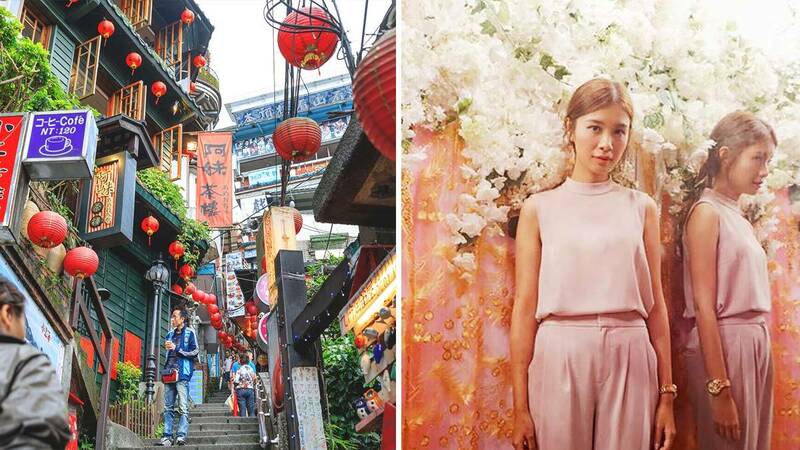 Take a trip to Taichung and fill your day with stops to IG-worthy places like the Zhong She Flower Market. If you can only take photos in one place, this is IT! The Flower Market makes for a flawless backdrop for selfies and OOTDs with its fresh and colorful blooms. A must-do: taking a photo with the piano in the middle of the lavender field! Visit the Taiwan Glass Gallery Monastery. Taipei is home to beautiful temples like the Mengjia Longshan Temple and the Dalongdong Baoan Temple, but the rest of Taiwan is worth a visit too. One of the most memorable temples outside the city is the Taiwan Glass Gallery/Museum & Temple in Lugang. Aside from having stunning architecture, you’ll find that the dazzling play of light from the temple’s glass materials will give you a sense of peace.